NEW YORK--(BUSINESS WIRE)--Over the past nine years, the number of women-owned firms has grown at a rate five times faster than the national average, reaching a post-recession high, according to the 2016 State of Women-Owned Businesses Report, commissioned by American Express OPEN (NYSE:AXP). The sixth annual report, which is based on historical and current U.S. Census Bureau data and Gross Domestic Product data, found that between 2007 and 2016, the number of women-owned firms rose by 42% with women starting 1,072 (net) new businesses per day. Additionally, the report indicates that women-owned firms now number 11.3 million, employ nearly 9 million people and are generating more than $1.6 trillion in revenue. Women-owned firms are outpacing the national average in both job creation and revenue generation post-recession. Employment growth among women-owned firms is strong with an increase of 18% since 2007, while hiring declined 1% among all businesses during the same time period. 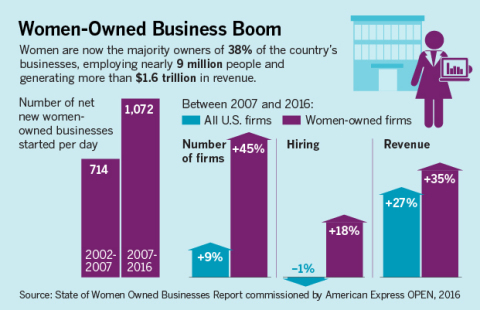 In addition, business revenues among women-owned firms increased by 35% since 2007, compared to 27% among all U.S. firms. With this growth, women are now the majority owners of 38% of the country’s businesses, up from 29% in 2007. Among women-owned firms, one of the fastest growing sectors are businesses owned by women of color. Over the past nine years, the number of firms owned by women of color more than doubled, increasing by 126%. In addition, the nearly five million businesses owned by women of color make up almost half of all women-owned firms. These businesses employ two million workers and generate $344 billion in annual revenue. When comparing the growth in the number of firms owned by women of color with women-owned firms overall, nearly eight in 10 (79%) of the net new women-owned firms were started by a woman of color since 2007 (an increase of 2.8 million). and approximately 31,100 Native Hawaiian/Pacific Islander women-owned firms. Since the recession, the greatest growth in number of women-owned firms was seen in the South. Eight out of the 10 fastest-growing states for number of women-owned firms between 2007 and 2016 are located in that region and are: Florida, Georgia, Texas, Michigan, Mississippi, South Carolina, Tennessee, The District of Columbia, South Dakota and Louisiana. New in this year’s report is a look at the industry composition of women of color, which found that there are more African American women-owned firms in both the other services sector and health care and social assistance sector than any other ethnic group. Additionally, female Asian American-owned businesses are more concentrated in the accommodation and food service sector, while most Latina-owned firms are found in administrative, support and waste management services businesses. The 2016 State of Women-Owned Businesses Report, commissioned by American Express OPEN, is based on data from the United States Census Bureau, specifically their quinquennial business census, the Survey of Business Owners (SBO), which is conducted every five years in years ending in 2 and 7. Data from the past three Census surveys – 2002, 2007 and 2012 – were collated, analyzed and extrapolated forward to 2016, factoring in relative changes in Gross Domestic Product (GDP) not only nationally but also at industry, state and metropolitan statistical area levels. All GDP data were obtained from the Bureau of Economic Analysis (bea.gov) – another bureau, like the Census Bureau, within the U.S. Department of Commerce. Specifically, growth in GDP from 2002 to 2012 ($10.6 to $16 trillion) was compared to that from 2012 to the fourth quarter of 2015 ($16 to $17.2 trillion). Relative annual growth rates were then used to estimate the growth in the number of firms over the 2012 to 2016 period – thus adjusting a straight-line extrapolation to account for relative economic growth between the two time periods. This was done not only at the national level, but also by applying actual gross state, metro area and industry-level output figures (which were available up to the fourth quarter of 2014). 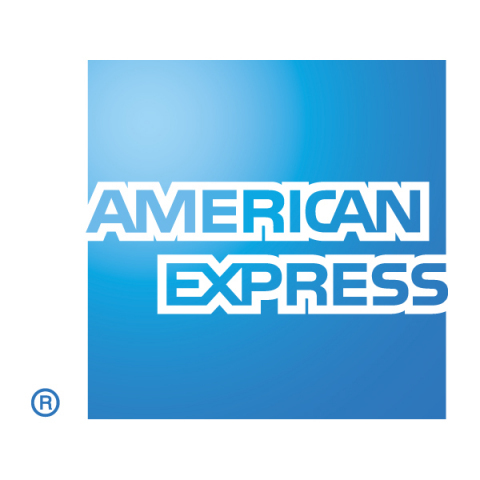 American Express OPEN is a leading payment card issuer for small businesses in the United States and supports business owners and entrepreneurs with products and services to help them run and grow their businesses. This includes business charge and credit cards that deliver purchasing power, flexibility, rewards, savings on business services from an expanded lineup of partners and online tools and services designed to help improve profitability. Learn more at www.OPEN.com and connect with us at openforum.com and twitter.com/openforum. This report was prepared for American Express OPEN by Womenable, a research, program and policy development consultancy whose mission is to improve the environment for women-owned businesses worldwide. Womenable pursues this mission by working with the stewards of women's entrepreneurship around the world – policy makers, multi-lateral organizations, corporate decision makers, entrepreneurial support organizations and the women's business community – to evaluate, implement and improve policies and programs to support women's enterprise development. Learn more at womenable.com.